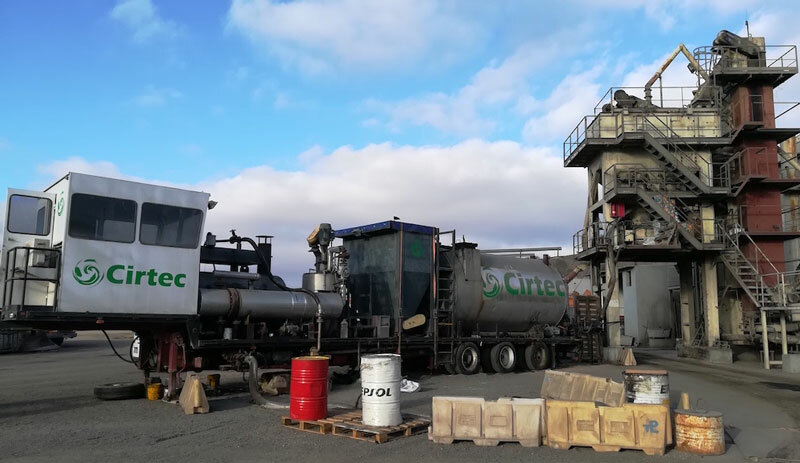 The bitumens with end-of-life tyre powder manufactured by CIRTEC are produced and consumed on site, and on demand, in the asphalt mixing plant (agglomerate plant). For this reason, no storage requirements are included in the product specifications. 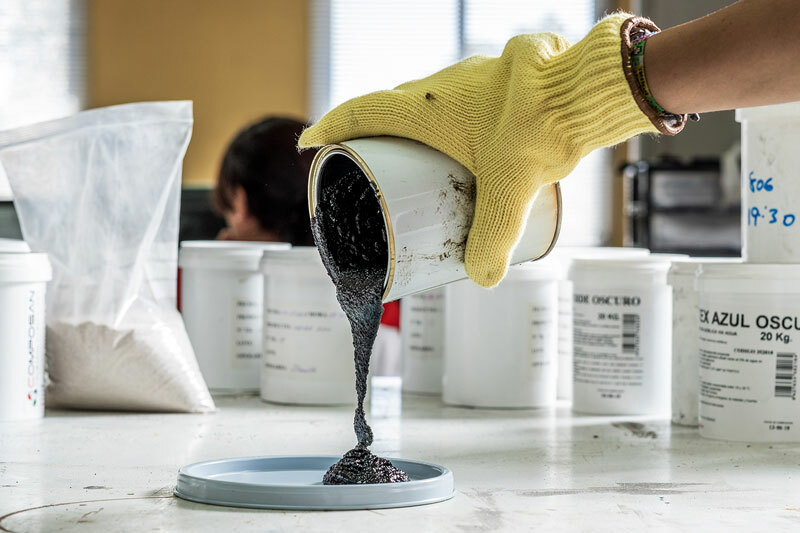 Its is important to note that the procedure for the manufacture and supply of bitumen with end-of-life tyre powder used by CIRTEC involves the so called wet process, whereby an initial mixing of conventional bitumen with end-of-life tyre powder is carried out, and the resulting product is then subjected to a digestion process in which the particles of end-of-life tyre powder are incorporated into the structure of the conventional bitumen, modifying its properties. This digestion process takes place in a digestion tank prepared for this purpose, so that the bitumen obtained at the tank outlet –which has already been modified with end-of-life tyre powder – is sent directly to a mixer in the agglomerate plant in order to produce the bituminous mix using aggregates. The wet process, accordingly, differs from the so called dry process in that, in the course of the first process, the end-of-life tyre powder is incorporated into a binder, and this, once modified, is mixed with the aggregates, while, in the course of the dry process, the end-of-life tyre powder is directly incorporated into the mixer as if it were just another aggregate, and the process of digestion of the end-of-life tyre powder takes place during the transport of the bituminous mix to the paving site. Specific equipment is used for the on-site manufacturing of bitumens with end-of-life tyre powder. This type of bitumen is composed of asphalt bitumen and rubber powder (Figure 2). Pure bitumen is stored in the tanks of the bituminous mix manufacturing plant, while the rubber is usually supplied in bags weighing about 1,000 kg. 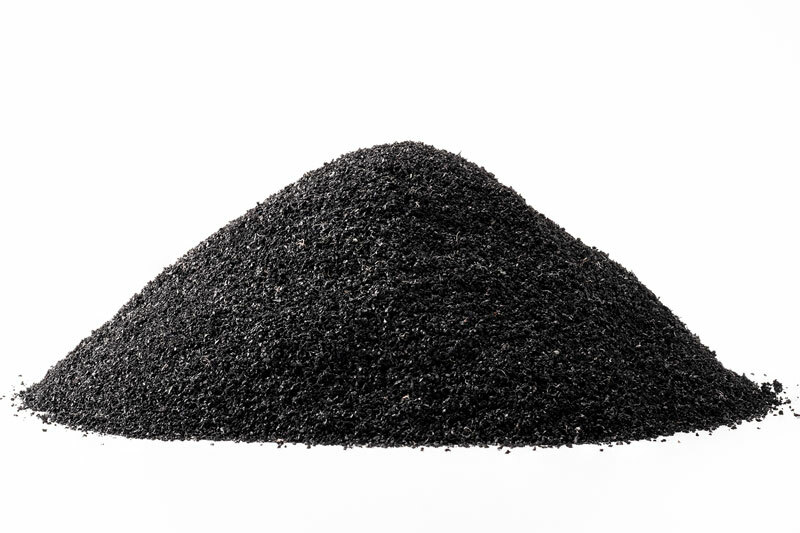 The rubber used in the process is produced as a shredded material with a maximum size not exceeding 0.8 mm (Figure 3). This procedure enables quick packaging in the tyre shredding facilities, as well as efficient transport and on-site storage, protecting the rubber against rain through use of waterproof bags. The manufacturing unit, whose layout is shown in Figure 4, is placed on a semi-trailer, which is then moved and installed in the plant for the manufacturing of bitumen mixtures. Once parked, the tractor unit can leave the premises, and the semi-trailer carrying the manufacturing unit can remain in position. Figure 5 shows a manufacturing unit on its semi-trailer. 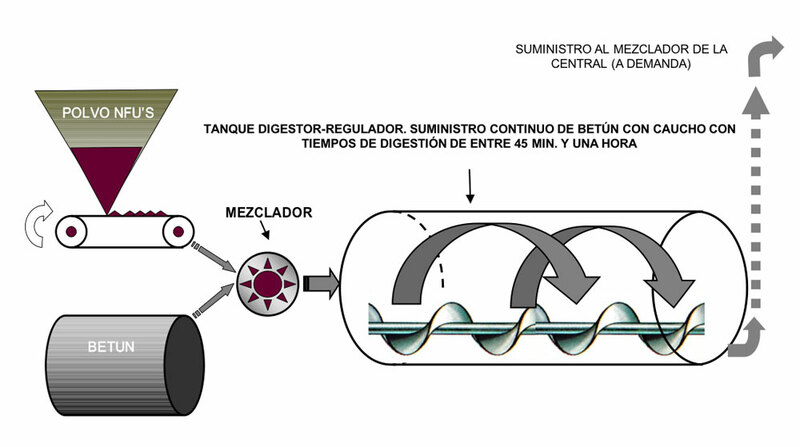 Figure 5: Bitumen-rubber manufacturing unit. Once the mixing unit has been positioned, the supply of asphalt bitumen is connected from the tanks of the plant where the bitumen mixes are produced; the hopper is then loaded with rubber and, through a conveyor belt built into the equipment and provided with an automatic weight-based dosing system, the mixer-shaker is fed with rubber. Finally, the newly manufactured bitumen-rubber goes into a digesting-regulating tank. It is very important to clarify that the bitumen with rubber manufactured by CIRTEC never goes into the tanks of the manufacturing plant, since these tanks are exclusively used to supply pure bitumen to the mixing unit, from which an already modified binder is directly pumped into the mixer of the plant manufacturing the bituminous mixture. For this reason, it is IMPOSSIBLE for the tanks of the manufacturing plant to be damaged in any way by using this system. From this tank, the bitumen – already modified with rubber powder – is conveyed to the mixing plant at the pace better suited to its needs. For this purpose, the outlet of the digesting-regulating tank is attached to the bitumen pipe that regularly conveys the binder to the mixer. The mixing unit itself has a pump that drives the binder through this pipe whenever it is demanded from the control post of the manufacturing plant; all of which is carried out using automated mechanisms. In the case of bitumens improved with the addition of rubber (BC bitumens), the manufacturing and supply capacity is about 15 tonnes of BC/hour, which amounts to about 300 tonnes of bituminous mixture per hour. In the case of bitumens modified with rubber and polymers PMB or high viscosity bitumens with rubber BMAVC, the production capacity is 12 tonnes of BMAVC / hour, which makes it possible to reach 140 tonnes of mixture / hour in continuous operation, although this performance depends, in each case, on the characteristics and manometric height of the binder scale of the mixing plant. In the case of projects in which larger daily outputs than those indicated have been required, the two bitumen-rubber manufacturing equipment units have been moved to the site, and then operated in parallel and simultaneously, thus duplicating the above mentioned production data. It should also be noted, as a very important aspect, that the agglomerate plant can simultaneously produce hot bituminous mixtures for different projects, whether with conventional bitumen or bitumen-rubber. This is so because of the presence of two three-way valves used in order to drive the bitumen into the mixer, so that, in case the production of bitumen-rubber mixes is not required, these valves close and the CIRTEC team recirculates the bitumen manufactured with end-of-life tyre powder until it is demanded again in order to produce the asphalt mixture.